The ability to attend a monthly American Legion post meeting is not always feasible for members due to conflicting schedules, or health and mobility issues. 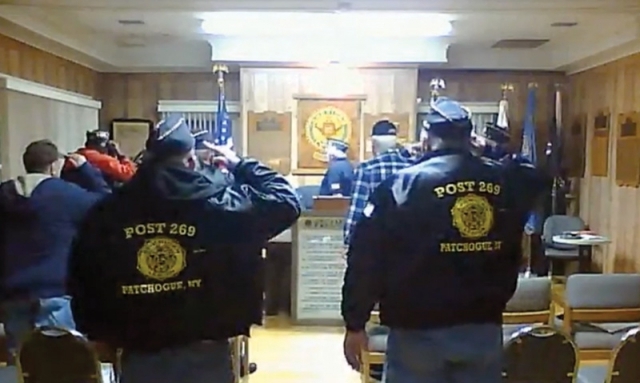 But Post 269 in Patchogue, N.Y., found a way to include all members in its monthly membership meetings – through online video conferencing. “We have several members who stated that they really wanted to attend our membership meetings, but just cannot do so. By providing an online video conference they are able to participate,” said Post 269 Commander Jonathon Ralph. The post uses www.FreeConferenceCall.com, an audio, web and video conferencing service that’s free to users. Legionnaires create a user ID and password and then install the software on their computer desktop. Ralph created step-by-step instructions on how to access and use the service, and how members can dial in to a post meeting. “One of my (online conferencing) selection requirements was that members did not have to enter any financial information such as credit card numbers. The user account registration for FreeConferenceCall.com only asks for the user to create an ID and password. There’s no request for credit card information,” Ralph said. A few members have taken advantage of the virtual meeting capability since it started last October, however, Ralph hopes once word spreads that more members unable to attend meetings will use it. During post meetings, a computer with a webcam, microphone and speakers is set up on top of a bookcase in the back of the meeting room. Legionnaires who dial in remotely through their computers have the ability to communicate with those at the post just like they would if they were there. For example, they can make a motion or second a motion when voting. “We can hear anyone on the video conference who is speaking,” Ralph said. Besides being free, a few other reasons why Ralph chose www.FreeConferenceCall.com was because it’s easy to install and set up; provides security since users must have the meeting ID; and it allows recording and download of video conference sessions. For the past three years, University of Akron American Legion Post 808 has used WebEx (www.webex.com) – an online meeting program – to host its post meetings virtually. For Post 808, housed on the university’s campus in Ohio, a virtual meeting is ideal for the post’s membership which includes student veterans, alumni (especially for those who have moved out of town or state) and faculty – all of who juggle class, work and other extracurricular obligations. Post 808’s monthly membership meetings occur on campus at the Musson Veterans Lounge where a computer with a webcam, microphones and the WebEx software installed is set up. There’s a monthly fee with WebEx, and like FreeConferenceCall.com, the software provides a downloadable copy of the meeting after it’s over.